One of the unfortunate things about AR at the moment is that most of the wearable implementations - namely, smartglasses - just aren't things you'd want to wear on a normal, regular, boring day. They're big and bulky. Or, in the case of Google Glass, ugly and limited in functionality. Alpha Labs might have made the closely thing yet to a regular, nothing-to-see-here pair of glasses. 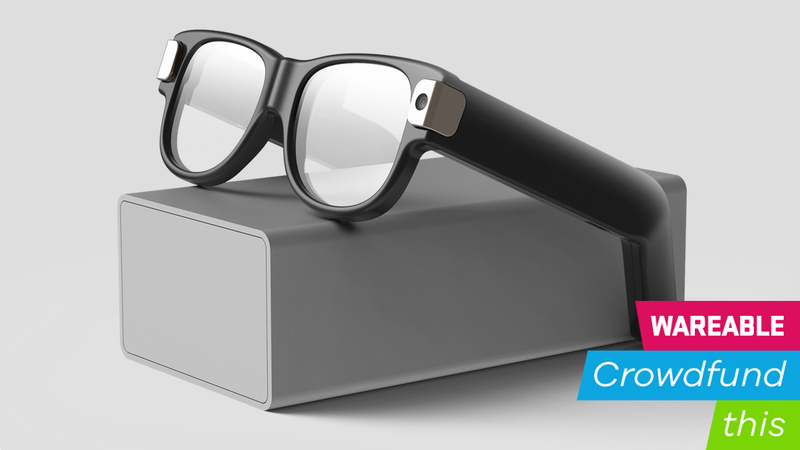 Available on Kickstarter as a developer kit for $720, the Alpha Glass wants to make AR smartglasses casual and easy to wear. They look like a normal pair of glasses, until you realize that there are two silver notches on the side - one of which houses a camera - and the thicker-than-usual arms. But they're smartglasses that display a rectangular AR box in the upper center of your vision, allowing you to see map directions, notifications, messages from friends and more. Much of the design, and product utility, came from Alpha Labs co-founder Junhee Lee's disappointment in Google Glass. While he was inspired to look into virtual and augmented reality because of both Glass and Oculus Rift way back in 2012, Glass was the one that really stung him. "I was personally very disappointed in the form factor and design of the existing products that did not allow the everyday usage," he told Wareable. "Thus I started to develop an optical system and that's how Alpha Glass started." The team always wanted to make a pair of smartglasses that looked like a regular pair of glasses, but to do that they needed to create a new optical system that could fit in a more svelte form factor. So they tore Google Glass apart. Lee says they disassembled a pair of Google's wearable, studied patents and research papers and found that there were systems using something called waveguides, but that the optical systems were lacking. So how does Alpha Glass work? Running on Android 5.1, it uses a micro OLED display that has its images collected by a collimator lens in the nose bridge, which then takes that image and bounces it onto the actual spectacle lens, letting you view the augmented reality content. Alpha Labs calls the tech a Separated Modular Optical System, company co-founder Junhee Lee tells Wareable. The system gives you a 30-degree field of view, but that's not the only piece of tech stuffed into these glasses. There are also bone conduction speakers in the arms that'll allow you to listen to music or get voice guidance. Yes, there's a personal AI assistant that uses a built-in microphone and call phrase - like "OK Google" or "Hey Siri" - to use the assistants as you normally would on your smartwatch or phone. Actually most of the smart features use your phone or wearable. For instance, the Alpha Glass will use your phone's GPS for directions, displaying them right in the center of your viewpoint with a slight transparency so you can still see your surroundings. You can also bring in your heart rate from your Apple Watch or another Bluetooth-connected wearable. Taking a photo with that built-in camera will transfer it to the companion app, which will then allow you to share them. Speaking of that companion app, you can use it to customize what you see in the rectangular AR window. Ah yes, a wonderful question worthy of great praise. Alpha Labs has been working on this technology since 2014 and has gone through two prototypes, showed them off at big events like Mobile World Congress and has even been accepted into the HAX Accelerator, which is one of the biggest hardware accelerators in the world. That means the company has been preparing its product for a 3 years, and has something that it can show off and get people interested in. Being a part of an accelerator also means that it has the support of mentors to help it, should any issues arise, Lee says. However, most of of the focus of the Kickstarter is focused on getting the Alpha Glass into the hands of developers to build up a content library and fine-tune the product for consumer release, which will have a $999 price tag. Because it's largely aimed at developers, many of the price tiers are extremely expensive, meaning that this is only aimed at those who are intensely interested in jumping into AR. If you can manage to take a risk on a product that, for now, is mostly intended to build developer support and want to jump in and participate in a new wave of lightweight, casual AR smartglasses, then the Alpha Glass is one of - if not the - best looking pair of AR goggles you can wrap around your face. For now.